Where exactly do riders experience the maximum advertised G-force of 5.9 on the loops for Shockwave? I am working on a physics presentation and do need to explain the forces experienced throughout the ride. I'm going to hazard a guess and say as the train enters the first loop, where it starts to get tighter, is where the maximum G force occurs. Second place goes to the exit of that loop, third and fourth belong to those same spots on the second loop. The differences are going to be slight, but there will be differences due to drag on the train. My completely unscientific (but fairly experienced) opinion is that it's in the entries and exits to the loops. Even though the radius of curvature isn't that tight, you have gravity working with you instead of against you and you're going significantly faster. Changes in direction and/or speed imparts forces. Entries and exits to loops, like hills, change the speed and/or direction quickly. It's why we prefer more triangular-shaped hills rather than parabolic ones. The maximum g-forces would be at the beginning and the end of the loop. G-forces are calculated using the Centrifugal Acceleration formula, which uses speed and radius. 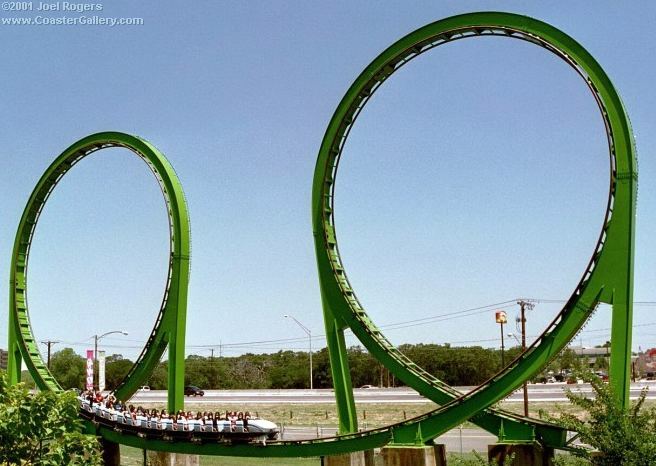 The highest speed would be near the ground as the coaster enters the loop. The loop is not a perfect circle, rather an inverted tear drop. The loop's shape is a result of rider comfort. A circular loop would require sufficient speed (and g-forces) to make the complete loop. The inverted tear drop, aka Clothoid loop, is essentially a circular loop "squashed" at the top. This loop is shorter in height, requiring less speed to travel through the loop. G-forces are found using the Centrifugal Force equation. Your conclusion is not supported by your analysis. The highest speed is near the ground but the largest radius is also near the ground. Also, you didn't add in the component of gravity. I'm not saying you're wrong, just that your reasoning is incomplete (in addition to hard to follow). But this question is pretty much asked and answered. The reason for teardrop-shaped loops is to increase the angular acceleration going through the top of the loop, where gravity is pulling you one way and angular acceleration is pulling the other. The train is already moving slowly up there, plus gravity is pulling the wrong way. At the bottom, you have plenty of speed, gravity is (still) pulling downward, and the angular acceleration and gravity are piling on. The trouble with a circular loop is that in order to have enough outward force going through the top of the loop to keep the riders anchored in their seats, the train will subject riders to a much larger force at the bottom. Making it narrow at the top increases the force there so that the force *can* be smaller at the bottom. Huh. And here I was going to tell him to simply build it in RCT2 and watch the fun little "g-force" thingy as the train moves through the course. I'd stick with Dave. And here I was going to tell him to simply build it in RCT2 and watch the fun little "g-force" thingy as the train moves through the course. Damn you, beat me to it. Everything I know about g-forces on roller coasters comes from rct2. That's what make discussions here on CoasterBuzz so enjoyable; that people usually don't just post whatever comes to mind. Before you hit the "submit reply" button, reread your post and ask yourself if it contributes anything meaningful to the conversation. I'm not trying to be a jerk here, buddy. :) I'm trying to help you, because the more people who participate in the discussion in a meaningful way, the better the conversation is. You are kind of new to CoasterBuzz. You'll get it, but it might take some time. Peace bro.